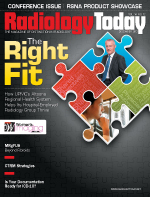 This issue’s cover story looks at what, by all evidence, is a successful example of a hospital-owned radiology practice. Boden spoke with Altoona Regional radiologists, a hospital administrator, and the consultants who brought them together. The result is a timely article about consolidation, collaboration, quality service, and communication—all essential components to the ongoing success of medical imaging in the coming years. Health care’s evolution—with or without full implementation of the Affordable Care Act (ACA)—is changing imaging in a couple important ways. First, fee-for-service (FFS) reimbursement continues to be squeezed, reducing the profit margins for imaging procedures. That, in my opinion, will lead to further consolidation as imagers seek greater efficiency and market clout. Second, while it’s still early in the process, reimbursement is starting its move away from FFS toward a value-based system. If the ACA takes hold, accountable care organizations (ACOs) will foster more capitated reimbursement. That said, I think imaging services largely will end up as a service that ACOs purchase—at a discount, of course. I don’t see many independent radiology groups rushing to buy into an ACO contracting group, given how little influence radiologists will have over utilization. While I expect more hospital ownership in medical practice in general, I’m also not convinced that it will prove dominant. Even so, the situation at Altoona Regional speaks to the need for hospitals and radiology groups to work collaboratively and find ways to truly align their incentives. If you’re reading this at RSNA in Chicago, where this issue will debut, stop by booth 3112 and say hello. It’s a pleasure to meet Radiology Today readers in person.